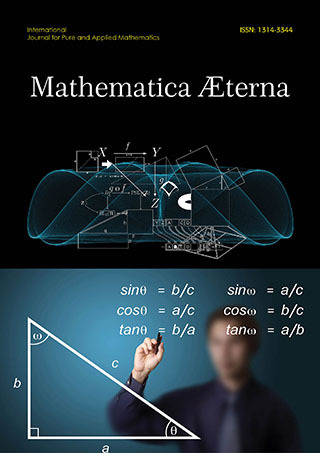 Mathematica Eterna is a peer reviewed an open access journal that aims at providing a dedicated forum for the researchers and academicians to share and exchange knowledge and innovations in the field of pure and applied mathematics. The journal publishes articles based on updated and reliable information in mathematics and accepts articles in the form of research articles, review articles letters, perspectives, opinions, commentaries, reviews, letters to editor, editorials and short communications. MathematicaÆterna is indexed in Google Scholar, DRJI, DOAJ, Electronic journals library, zbMath, ulrichs web, EBSCO, SJIF, Scientific Indexing Services, International Impact Factor Services and several other databases. The journal consists of distinguished and eminent editorial board members who take care of the stringent peer review process that helps in maintaining the quality of the journal.Manuscripts will be published upon getting the final approval from the editorial board members. The journal supports open access publishing model to maximize the reach and provide an easy access of the published articles. The Editorial Manager System of the journal allows authors to submit article, track article status, respond to the reviewers’ comments, and revision requests. This multipurpose tool allows editors and reviewers to get access to the manuscript for review and to communicate with author.